Fall has finally fallen here in the Los Angeles area and the air is cooler and less dry. Ben dressed himself in a tee and shorts, and I simply suggested that he put on something a little warmer. So he added this scarf. He was delighted with how well they went together! The argyle pattern, the variegated yarn... yes they do go together, Ben. He finally put on jeans and took along a sweater as well, and left the scarf at home (I didn't say a word, it was his choice). 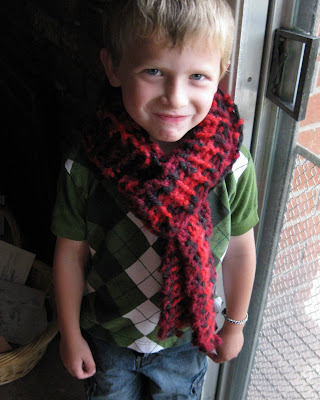 He asked me if I would teach him to crochet his own scarf and if he could pick his own colors. Should be exciting! I can make on for him! !